The Labuk Bay Proboscis Monkey Sanctuary lies 20km west of Sepilok near Kampung Sumawang in an area of mangrove forests. A large number of proboscis monkeys live here and are easy to see because twice a day they come close to an observation platform where they receive some food. The privately owned wildlife sanctuary is located within an oil palm estate and can only be reached from Sandakan by taxi or by a transfer service offered by the sanctuary (advance booking necessary). 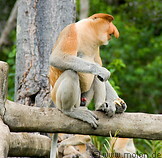 The sanctuary is the best place in Sabah where to observe wild proboscis monkeys.